At a time when Canada's refugee and immigration policy is being hotly debated, the small community of Morden, Man., has seen its size nearly double in the last decade, much of it as a result of foreign workers recruited under a provincial program. Sathiyaseela (Sheela) Ramesh and her family looked for years for a way to leave India and immigrate to Canada — and they finally found it through a strategic recruitment program run by a small community in south-central Manitoba. "It's not so easy to come to Canada without a connection like a friend or relative or a job offer," Ramesh said during a break from inspecting jackets at Deasil Custom Sewing in Morden. "Once we came here on exploratory visit, I got a job offer ... and then Manitoba nominated me to get permanent residence status in Canada." At a time when Canada's refugee and immigration policy is being hotly debated, the small community of Morden has seen its population nearly double in the last decade. Much of that can be attributed to foreign workers recruited to Manitoba under the provincial nominee program. "I believe that it's changed the community for the better," said Shelly Voth, immigration co-ordinator for the City of Morden. "You look in the school system and my friends and my sons have friends from different cultures. It's a great way to integrate those families. I think our community is friendly and open and has been enjoying the diversity." In 2015, Morden had a population of 8,668, an increase of 11 per cent from the 2011 census. The most recent estimates put the population of the city southwest of Winnipeg at about 9,000 people. "Probably in the last 10 years, it's close to have doubled," Voth said. "A lot of that would be attributed to immigration." That diversity is obvious at Deasil Custom Sewing, where workers are making coats and vests for a well-known international clothing brand. More than 90 per cent of Ron Funk's employees are newcomers and most of them came through Manitoba's provincial nominee program. "We don't have any trouble finding work, we have trouble finding enough people," said Funk. "Having the immigrants coming to our facility and taking the training and having them help us is essentially determining our growth." Sewing machine operator Gurpreet Munday, her husband and two children came from their home in India to visit Morden two years ago. They fell in love with the city. "It's good for kids to grow here. Zero crime. They love the school," she said during a break from her hemming. "We like having good jobs so we are having a good place to live here. We love the place," she said. "Everybody dreams of coming here to Canada, so we had a good fortune that we are here." One station over, Ramesh is inspecting the clothes before they're packed for shipping. She said her family has not regretted their decision to move to Morden from their home in eastern India. "I came from [the] city of Chennai. It's our most modern city with 20 million people. This is a small city but I like here. There is no traffic. People are so good and kind and helpful. There are so [many] opportunities also to improve our career and for kids there are many things to do here," she said. "When I came here I saw on the cars 'Friendly Manitoba' and it is very true." It all began 20 years ago with Manitoba's provincial nominee program, one of the very first experiments in Canada matching foreign workers with specific job openings. It's a fast-track option, allowing provinces and territories to nominate people who want to immigrate to Canada, are interested in settling in a particular province or territory and have the skills, education and work experience to contribute to the economy. Each province and territory has its own criteria and "streams" — programs targeted to specific groups such as students, business people, skilled workers or semi-skilled workers. The more points they have, based on their work qualifications, experience and language ability, the faster they move up the queue in the immigration process. A definitive job offer by an employer is a significant benefit. After being nominated, applicants still have to apply to Immigration, Refugees and Citizenship Canada for permanent residence status. Manitoba's program remains one of the most successful. It boasts high recruitment and retention rates and accounts for a significant percentage of the province's population growth. "We see a program that has specific objectives. It's met them and it's one that we can measure as a successful government program," Winnipeg immigration lawyer Ken Zaifman said last month during a celebration of its 20th anniversary. According to provincial statistics, of the 130,000 immigrants who have settled in Manitoba through the nominee program since 1998, 85 per cent were working within three months and 76 per cent were homeowners within three to five years of their arrival. In 2012, Morden began a community-driven immigration initiative under the provincial program to attract even more people. Since then, it's brought 50 families a year to the rural community. "It's a win-win situation for us because we get to choose people that our employers want. I believe it's a win for [the program] because our retention is really good because of the support we give," Voth said. 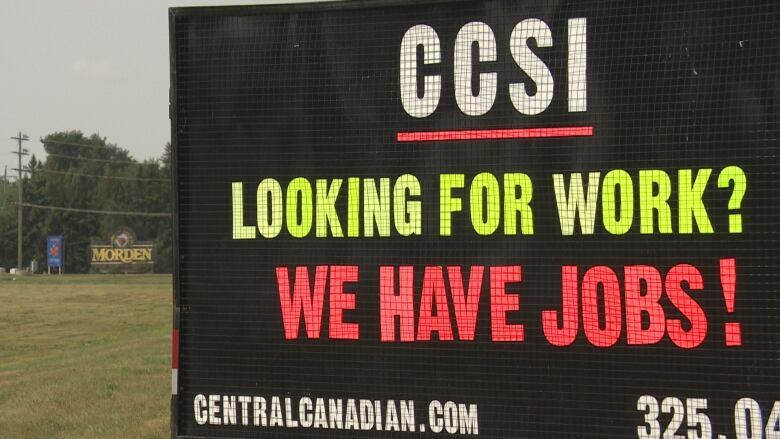 With an unemployment rate of just three per cent and a small local labour pool to draw from, Voth said some businesses might be hesitant to invest in the community "but because of our steady flow of people coming in and the fact that we can target skill sets to what they're looking for, it is a really great incentive for setting up in Morden." The city program has been so successful that other communities across the country come to get advice on how to set up their own strategic initiatives inside their provincial nominee programs, Voth said. The national and international rhetoric around foreign workers taking jobs from Canadians crops up now and then in Morden. Voth and others say they sometimes get asked why they're recruiting immigrants when there are local people without jobs. Their answer? Some of these are jobs Canadians don't want to do while others require skills and experience that can't be found — or recruited — in the area. And, Voth said, very few of those who apply are chosen. "It's not just an open the doors and anybody comes in. We go through a tough application. We're picking about five per cent of our applications," she said. "We're picking really good people and I think the success stories of the people that have been coming in speaks a lot for the program and also helps the community to be more comfortable with the program." Jim Duff, vice-president of manufacturing for ON2 Solutions, is working with Voth to find up to 200 workers in the next three years. He needs electricians and plumbers to help grow his business of manufacturing oxygen concentrators for hospitals and emergency shelters for mining companies. Duff has tried to hire local people, but says he can't find what he needs. "It's more than just the skill set. It's the work ethic. It's the contribution to the team, the desire to be part of the team. That's a hard thing to find," he says. "Our last interview process, we interviewed a couple of born and raised Canadians and the attitude was shocking, really, when it came down to it. I don't know how to put that in words but it was a significant difference." Duff has talked to the school division and local educational programs to try to train workers, but said he has run into the same problem. Meanwhile, he's thrilled with the workers he's hired through the provincial nominee program and Morden's strategic initiative. "I would very honestly say that if we didn't have these five people, we wouldn't be where we are now. I don't even know that we would necessarily be in business. I would say [the foreign workers are] that crucial," he says. Two of the people working for Duff are the husband and wife team of Victor and Ibi Kovtan. He's an electronics engineer. She's in charge of inventory control, purchasing and shipping and receiving. They and their four children moved to Morden in 2015, leaving Ukraine because they didn't feel it was safe anymore. "When we came for the visit, we had a conversation with two companies and one of them said, 'If you would come today we would hire both of you right away.' So that was a big plus," Ibi said. "Yeah, you know, I never sent a resume here in Canada," Victor said. "From one thing, it's bad because I don't have the experience of how to send a resume but from [the] other way it's good for me that [a] job found me." The family has visited Vancouver and Toronto. They've even gone back to Ukraine to visit family and sell their house. But Morden is home. "We fell in love with Morden, its clean streets, rich nature, kind people," Ibi says. "We have everything a family needs. We have friends as close as family members. We have great jobs for five minutes' drive from our home, our children are happy with school, amenities and environment. We feel the support of our new country and our community and we are so thankful for all we have. "We are not planning to move."